Please pass along the attached application [pdf] for the 2018 A.D. Latornell Award of Merit to these students. Applications are also available at the Latornell Conservation Symposium website (http://www.latornell.ca/2018-symposium/swcs-award-of-merit/). This award was founded and is awarded annually by the Ontario Chapter of SWCS. The A.D. Latornell Award of Merit Program recognizes and celebrates Art’s commitment and service to our Society and Ontario. Art was involved in virtually every aspect of resources conservation during his lifetime and was a role model for many beginning a career in conservation. This Award also provides significant publicity for the Chapter and helps promote the mission of the Society. Due date to receive applications is October 9, 2018. 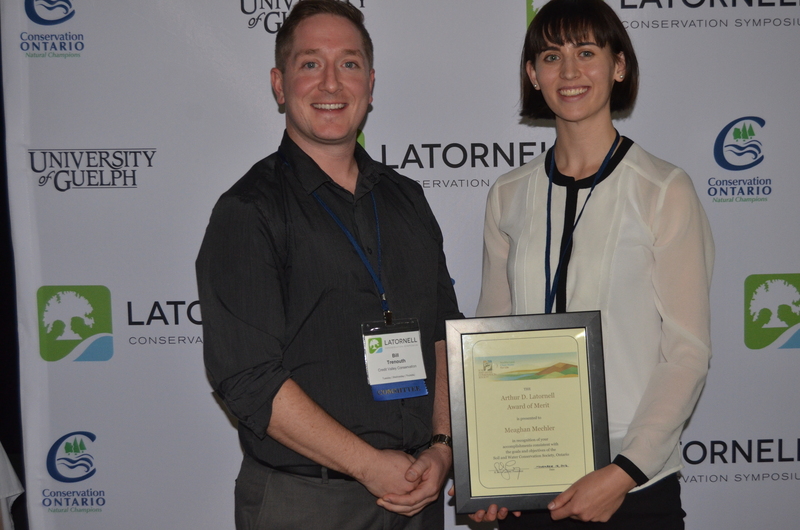 The award winners are announced at the A.D. Latornell Conservation Symposium in Alliston, Tuesday November 13, 2018. Award winners are provided registration to attend that day to receive their award, as well as $600 and a year’s membership in SWCS. The application form SWCS_Student_Application_2017.docx is now available for the 2017 A.D. Latornell Award of Merit presented annually by the Ontario Chapter of the Soil and Water Conservation Society (SWCS) (http://swcs-canada.org/) . The A.D. Latornell Award of Merit Program recognizes and celebrates Art’s commitment and service to SWCS and Ontario. Art was involved in virtually every aspect of resources conservation during his lifetime and was a role model for many beginning a career in conservation. Due date to receive applications is September 25, 2017. The award winner is announced at the Latornell Conservation Symposium in Alliston, Tuesday November 21, 2017​​. Award winners are provided registration to attend that day to receive their award, as well as $600 and a year’s membership in SWCS. The Ontario Chapter of SWCS is happy to announce that the Award Committee has selected Meaghan Mechler as this year’s recipient of the A.D. Latornell Award of Merit for 2016. Meaghan Mechler is beginning her Masters of Geography and Environmental Management, studying soil biogeochemistry at the University of Waterloo where she completed a joint honours degree in Biology, and Environment & Resource Studies. She has been “passionate about studying soils and agriculture since her second year of undergrad” and found herself taking numerous water, soil, botany, and microbiology courses. Meaghan is excited about soils, in particular agricultural soils, and the strong influence soil management and health can have on both water and air quality. “Soil degradation is an issue of serious importance” to her and she would “advocate that many others would reflect upon soil impacts in their work so that a larger quantity and diversity of solutions to soil degradation could be found”. Apart from her studies, Meaghan has been analyzing the soil quality on her family’s organically-managed farm and designing a soil-building permaculture experiment to conserve the land, biodiversity, and spring-fed creeks on the property. For many years Meaghan has been involved with the County of Wellington Green Legacy program. There she contributed in many ways to the planting of trees for buffer zones and living windbreaks, as well as teaching school children about local biodiversity and resource conservation. Meaghan hopes this award will provide opportunities for networking to connect her to SWCS and other resources to further her education and studies, but as importantly to discover ways she can develop and contribute her evolving skills to projects in the soil and water conservation community.